Mike Hedden scores for Devils against Steelers. Pic: David Williams. Charles Linglet and son Vincent took centre stage for Cardiff Devils over the weekend. Dad Charles fired two goals for Devils in their crushing 7-3 win against Sheffield Steelers at the Viola Arena, while Vincent netted twice on his debut for the Junior Devils. Head coach Andrew Lord was delighted with his Devils players after their hit Steelers for six in the second and third periods. Devils were trailing 3-1 before battling back with six unanswered goals to secure the points. “A great win, one of our best this season,” said Lord. “We were down a few bodies and it was a wild week with a little bit of adversity. “We couldn’t get the job done against Manchester on Saturday and at 3-1 down against Sheffield it could have been tough. “But I loved the character, we kept fighting, kept fighting, stuck to our game plan and it paid off. 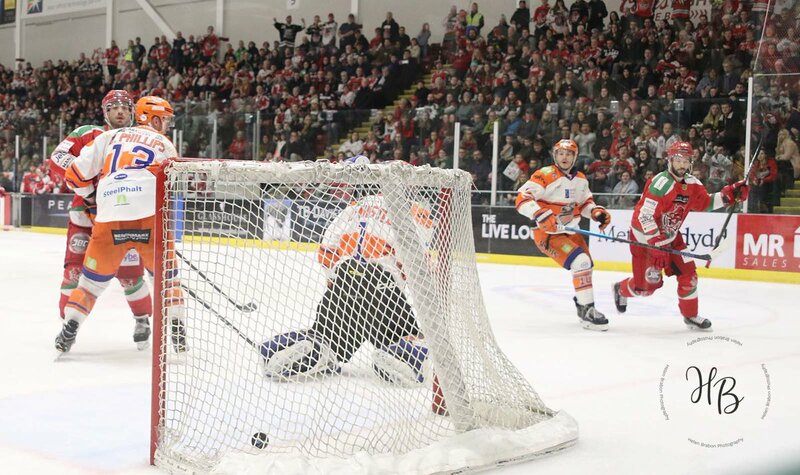 Linglet opened the scoring at nine minutes 19 second with a rocket shot which left goalie Jackson Whistle helpless, but Steelers hit back almost immediately with a breakaway goal from Josh Pitt to tie the game at 10-39. Sheffield took the lead with one minute 40 seconds left in the opening period through a blast from Ben O’Connor to make it 2-1. Four minutes into the middle period, Steelers added to their lead when Evan McGrath scored on the powerplay at 24-06 to give the visitors a 3-1 advantage. Then Devils took control, winning the second 4-1 and the third 2-0. Linglet netted a power play strike at 26-58 and then James Livingston followed Linglet’s first goal example with a rocket over the shoulder of Whistle in goal for the Steelers, but the officials waved play on. At the next stoppage the referees called for a review, quickly awarded the goal and the clock went back to the time Livingston’s shot hit the net. Cardiff Devils D-man Mark Richardson in on goal against Steelers. Pic: Helen Brabon. Mike Hedden put Devils 4-3 ahead at 35-13 with another powerful shot to put the home side up 4-3 and 43 seconds later Joey Martin made it 5-3 with a perfect finish after a slick pass from Hedden. Devils made it 6-3 just two minutes 18 seconds into the final period when Mark Richardson mishit a shot towards goal and Sean Bentivoglio tapped it on the way by to beat Whistle. One minute 52 seconds from the end Toms Rutkis scored Devils’ goal by jamming in a loose puck after Matt Pope took the puck to the net. Ben Bowns made 30 saves for the win, while Mike Hedden was man of the Match with a goal and two assists. James Livingston shoots the rebound after his first shot flew into the Steelers net and came out. The goal from his first effort was awarded after a video review. Pic: Helen Brabon. Period scores (Devils first): 1-2; 4-1 (5-3); 2-0 (7-3). Shots on goal: Devils (on Whistle) 10+12+11=33; Steelers (on Bowns) 9+11+13=33. Special teams: Devils PK 3/4, PP 1/3; Steelers PK 2/3, PP 1/4. Stars of the game: Devils, Mike Hedden; Steelers, Josh Pitt. Scorers, Devils: Charles Linglet 2+1, James Livingston 1+0, Mike Hedden 1+1, Joey Martin 1+2, Sean Bentivoglio 1+0, Toms Rutkis 1+0, Gleason Fournier 0+3, Ben Bowns 0+1, Bryce Reddick 0+1, Mark Richardson 0+1, Stephen Dixon 0+1, Matt Pope 0+1, Matthew Myers 0+1. Steelers: Josh Pitt 1+1, Ben O’Connor 1+0, Evan McGrath 1+0, Tanner Eberle 0+1, Mark Matheson 0+1, John Armstrong 0+1, Eric Neiley 0+1, Jordan Owens 0+1. Referees: Tom Darnell and Tom Pering.